Yard of the Month for August is awarded to Sandra Yarnall of 8613 Averell. The green lawn, manicured shrubs and colorful flowers show that this homeowner takes pride in her yard’s appearance. The judges have noted how consistent effort can make a fescue lawn look good even this time of year. Sandra has finished in the top three for the last three months. 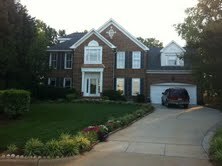 Runner up for August and and a new contender for Yard of the Month is the Markham residence of 2640 Iman Drive. Despite the summer’s heat, the Markham’s lawn looks great. Finishing third and a consistent top three finisher is Carey Bitterfield of 8524 Yucca Trail. For tips on how to get your lawn looking great, check out the post “Time to Renovate”. Our recent rain cycle makes this the perfect time to aerate and overseed. Congratulations to the homeowners and thanks to Bill Pappas and Mimi Raub who assisted me on the judging panel. The Architectural Committee will conduct an open meeting on Thursday, September 15, 2011 to review two proposals to bring to the Board at its next scheduled meeting. The first topic will deal with proposed changes to the Association Architectural Guidelines. The second topic will be to focus on areas to be incorporated in a revised Master Plan and the development of the plan.